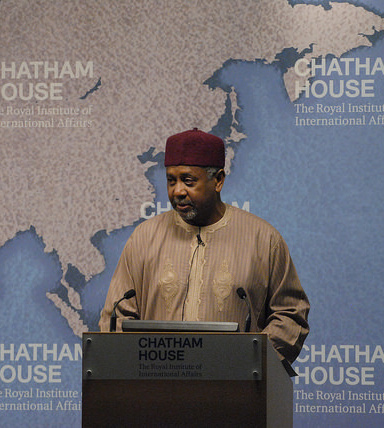 Former Nigerian National Security Adviser Sambo Dasuki speaks in London on Feb. 13, 2015. Flickr/Creative Commons, Chatham House. Most corruption in arms procurement takes the form of bribes or kickbacks. In return for being awarded an arms contract, often as a result of having selection criteria manipulated in its favor, the supplier company pays bribes to officials involved in the decision-making process. Payments typically are channeled through an in-country middleman or agent. But why be satisfied with bribes or kickbacks equaling 10% of the value of a contract when you can take the whole lot? In countries where oversight of military funds is at its weakest, or indeed non-existent, top officials and military officers have essentially free reign over how money is spent. In such circumstances, those in charge can simply misappropriate funds directly, needing only the thin cover of a fake contract for non-existent equipment. Year of procurement decisions: 2007-2015, but mostly after 2012. Equipment sold: Mostly fake contracts for equipment that was never delivered. Largest contract was for 4 Alpha jets and 12 helicopters, also never delivered. Value of contracts: Unknown. ‘Extra-budgetary interventions’ between 2007 and 2015 totaled between USD 4.5 and USD 7.2 billion, but other contracts from budgetary funds may also have been involved. Initial investigatory committee studies contracts amounting to over USD 19 billion. Sum involved in corruption allegations: At least USD 2.1 billion, possibly as much as USD 15 billion. Goodluck Jonathan – president of Nigeria (2010 – 2015); appointed Sambo Dasuki as National Security Advisor. Mohammadu Buhari – president of Nigeria since 2015; ordered the Armsgate investigations. Col. (retd.) Sambo Dasuki – national security advisor under Goodluck Jonathan (June 2012 – July 2015); the lynchpin in the armsgate scandal. Indicted by an investigating panel in November 2015, arrested Dec. 1, 2015. On trial on 32 fraud charges stemming from the theft of USD 2 billion in phantom arms contracts for 12 helicopters, 4 fighter jets, and ammunition. Bashir Yuguda – former minister of state finance (2014-15); charged in December 2015 with 19 counts of fraud, money laundering, and criminal breach of trust. Air Chief Marshall (retd.) Alex Badeh – former Chief of Defence Staff; arrested Feb. 8, 2016; assassinated Dec. 18 2018. Chief Raymond Dokpesi – owner of a Lagos-based private TV station; arrested Dec. 1, 2015. The transactions involved in the Armsgate scandal took place under the rule of the People’s Democratic Party (PDP) government of Presidents Umaru Yar’Adua, who ruled from 2007 until his death in 2010, and Goodluck Jonathan, Yar’Adua’s vice president, who took over in 2007 and subsequently won reelection in 2011. At the center of the web of corruption is Col. (retd.) Sambo Dasuki, Jonathan’s National Security Advisor (NSA) from March 2012 to March 2015. Dasuki effectively controlled military procurement during his period in office with no supervision and virtually no input from the Ministry of Defence. 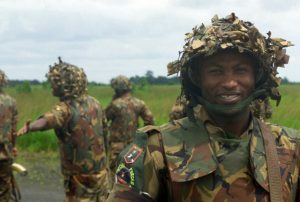 An MT-LB of the Nigerian Army photographed in May 2015. 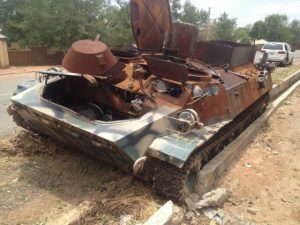 It was captured by Boko Haram and destroyed during military operations near Marrabara, Adamawa state, in March 2015. Wikimedia/Creative Commons, Jambanja2009. The first public details of Armsgate were presented in the interim report of a government-appointed investigative panel on Nov. 17, 2015. The numbers contained in official public statements on the report are somewhat ambiguous , due to the use of multiple currencies and what appear to be overlapping sums of money, but by any reading expose massive fraud in arms procurement. The report stated that between 2007 and 2015, there had been ‘extra-budgetary interventions’ for arms procurement totaling NGN (Nigerian naira) 643.8 billion, and that the ‘foreign currency component’ was USD 2.2 billion. These appear to be two separate sums involved in the corruption scandal, as over the period in question, the naira was never below 200 to the U.S. dollar. Thus, the total value of these ‘extra-budgetary interventions’ would have amounted to somewhere between USD 4.5 billion and USD 7.2 billion, depending on the timing of the naira transactions and the exchange rate at the time. Thus, according to the report, around USD 2.5 billion worth of ‘failed contracts’—that is, contracts for which no goods or services were delivered—occurred between 2007 and 2015. The total value of contracts awarded—which amount to at least USD 19 billion—is clearly far higher than the extra-budgetary interventions. Hence, it would appear that the figures for failed contracts relate to all contracts, from both budgetary and extra-budgetary sources, and include regular contracts for goods and services as well as for arms. According to the report, Dasuki awarded ‘fictitious and phantom contracts’ worth USD 1.7 billion for the procurement of four Alpha jets and twelve helicopters, as well as bombs and ammunition, which were never delivered. Most of the value of these contracts went to just two (unnamed) companies, despite, as the report notes, their previous record of non-performance. Moreover, the NSA directed the Central Bank of Nigeria to transfer USD 132 million and EUR 9 million to the accounts of a Nigerian company, Societé d’Equipements Internationaux (SEI), without any contracts to back them up. The total amount stolen remains uncertain. In early May 2016, Nigeria’s chief anti-corruption body, the Economic and Financial Crimes Commission (EFCC) reported that a previously-quoted figure of USD 2.1 billion related to just one transaction, and in total USD 15 billion had disappeared. If correct, this would be almost as much as the total official defense budgets between 2007 and 2015. It was also said to equal half of Nigeria’s foreign currency reserves. However, no further details of this figure have been produced. The beneficiaries of Armsgate, such as Dasuki himself, appear to have included a large number of senior military officers, politicians, government officials, and businessmen, and their families. The mechanisms of corruption appear to have depended on a complete absence of oversight of funds within the military apparatus. According to one observer, the rot truly began under Dasuki’s predecessor as NSA, Gen. Andrew Awoye Azazi (retired, now deceased), appointed by Jonathan in October 2010. While the Ministry of Defence itself was hardly a model of probity before the appointment, during Azazi’s tenure as NSA the office started to usurp the ministry’s procurement authorities, apparently with Jonathan’s approval. The ready justification of fighting Boko Haram allowed the government to effectively write blank checks for funds, supposedly for arms purchases, which could then be diverted into private bank accounts. When Dasuki took over as NSA, contracts could be signed and funds allocated without detailing tenders, competitions, proper accounting, or indeed any actual acquisitions to show for the contracts. In some cases, as noted above, funds flowed without even the formality of a contract. The financial rewards could therefore be freely shared out between Dasuki, other officers, officials approving the fake deals, and heads of real or paper companies to whom contracts were awarded. It appears that the Central Bank of Nigeria collaborated in the plunder, approving large transfers of funds to individuals and companies on the say-so of Dasuki or other individual senior officials. Perhaps the most surprising thing about Armsgate is that it came to light at all. Nigeria’s powerful military, which ruled the country for many years, had hitherto been effectively immune from investigation and prosecution for corruption. A few years ago, the website of Nigeria’s Economic and Financial Crimes Commission (EFCC) featured plenty of cases of prosecution of state governors, ex-ministers, civil servants, business people, and even police, for corruption, but none of military officers or Ministry of Defence officials. President Muhammadu Buhari, elected in 2015 on an anti-corruption platform, appears to have broken with this pattern of impunity. Nigerian Army Special Forces Soldiers performing security operations at Roberts International Airport in Liberia, on Aug. 8, 2003. U.S. Department of Defense, Nathan E. Eason. Investigations began shortly after President Buhari came to power in May 2015. On July 15, troops from the State Security Services raided Dasuki’s house, finding, among other things, twelve ‘exotic cars.’ Then on Aug. 24, Buhari appointed a panel of enquiry into arms procurement under the former government. Two weeks after the publication of the panel’s report on Nov. 17, 2015, Dasuki was arrested, initially on an illegal weapons possession charge. By May 2018, the charges against Dasuki had been increased to 32 counts of fraud. The EFCC also arrested several other officials implicated in the affair, including: Chief Raymond Dopkesi, founder of Nigerian media house Daar Communications; former governor of Sokoto state, Alhaji Attahiru Bafarawa; Shuaibu Salisu, a former director of finance and administration in the office of the National Security Adviser; ex-finance minister Bashir Yuguda; and Saliu Atawodi, the former chairman of the Presidential Implementation Committee on Marine Safety. Since then, ongoing investigations by the EFCC have led to a steady stream of raids, arrests and charges, with dozens of military officers, federal government officials, state governors, senior political party apparatchiks, and businessmen implicated and billions of naira in money and property seized. Numerous military officers have been stripped of their commands. Charges on Mar. 7, 2016, included using NGN 1.1 billion drawn from Air Force accounts to buy a mansion, NGN 650 million for another property, and NGN 878 million for construction of a shopping mall; total charges involved NGN 3.97 billion (USD 19.8 million). Much of this appears to have come from funds intended for salaries, rather than procurement funds. While his trial was still ongoing, Badeh was shot dead in his truck by unknown gunmen near his farm. The full story of Armsgate is still emerging, and thus far the details revealed are incomplete. A comprehensive list of those implicated and charged does not seem to exist, but in total at least 36 military officers have been named in reports, as well as many more government and business figures. The EFCC report also named 241 organizations as recipients of money from Dasuki. Thus far there have not been any reports of convictions in relation to Armsgate, although many trials have started. Dasuki’s trial has been repeatedly delayed, and he was illegitimately detained for more than two years. Rulings by three Nigerian courts and an ECOWAS (Economic Community of West African States) court eventually led to his release on bail in July 2018. In the most recent hearing in January 2017, the government applied to a court to keep the names and addresses of prosecution witnesses secret for their protection. In addition to those named above, the following individuals have also been implicated in the Armsgate affair: The list is not exhaustive. Attahiru Bafarawa, former Governor of Sokoto state, arrested Dec. 1, 2015. Iyiola Omisore, former Deputy Governor of Osun State, arrested July 4, 2016, over receiving NGN 700 million in stolen funds from the Office of the NSA. Former Chief of Air Staff Air Marshall (retd.) Adesola Amosu, arrested late January 2016. USD 1 million found in his apartment. Lara Amosu, his wife, arrested early February 2016. NGN 3 billion found in her bank accounts held in trust for her husband. Air Vice Marshal J.B. Adigun, Chief of Account and Budget of the Nigerian Air Force, arrested late January 2016. Air Commodore Akinwale, in the custody of EFCC. Air Commodore O. Gbadebo, in the custody of EFCC. Chief Olisa Metuh, spokesperson for the PDP, on trial for receiving NGN 400 million under Armsgate. Major General Yishau Mahmood Abubakar, property seized by the EFCC January 2016. Colonel Ojogbane Adegbe, a former aide-de-camp to ex-President Goodluck Jonathan, arrested February 2016 by the EFCC. 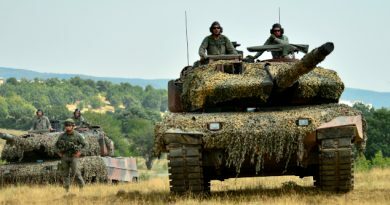 One of twelve senior officers, including three serving and one retired major generals, three brigadier generals, four colonels and one lieutenant colonel. Haliru Bello, former Chairman of the PDP, on trial since April 2016 for receiving NGN 300 million into accounts of his companies. Waripamowei Dudafa, former special advisor to Goodluck Jonathan, arrested April 2016, accused of sharing in NGN 10 billion taken from the office of the NSA and given to PDP candidates. Patrick Ziadeke Akpobolokemi, former director general of Nigerian Maritime Administration and Safety Agency (NIMASA), along with five others, standing trial accused of stealing NGN 2.6 billion from NIMASA. Bala James Ngillari, former governor of Adamawa state, questioned by EFCC for receiving NGN 450 million from Armsgate. Image Caption: Burned villages and fields in northern Nigeria as viewed from a UN Humanitarian Air Service helicopter in May 2017. Image Source: Flickr/Creative Commons, Roberto Saltori. Sani Tukur, “Why we raided Dasuki’s homes, and what we found — SSS,”, Premium Times (online), July 19, 2015, http://www.premiumtimesng.com/news/186903-why-we-raided-dasukis-homes-and-what-we-found-sss.html. Soni Daniel, “Missing cash: defence hqtrs detains generals, recalls others”, Vanguard Nigeria (online), Nov. 30, 2015, http://www.vanguardngr.com/2015/11/missing-cash-defence-hqtrs-detains-generals-recalls-others/. “Nigeria’s Dasuki ‘arrested over $2bn arms fraud,’” BBC News, Dec. 1, 2015, http://www.bbc.com/news/world-africa-34973872. Usman Mohammed, “The armsgate in perspective”, The Nation (online), Dec. 7, 2015, http://thenationonlineng.net/the-armsgate-in-perspective/. “EFCC files fraud charges against Dasuki, Yuguda, Dokpesi, Bafarawa, others,” Global Patriot Times (online), Dec. 9, 2015, http://globalpatriotnews.com/efcc-files-fraud-charges-against-dasuki-yuguda-dokpesi-bafarawa-others/. Olu Fasan, “Armsgate: the scandal that ravages Nigeria’s critical institutions,” The Government and Business Journal, Jan. 25, 2016, http://govandbusinessjournal.com.ng/armsgate-the-scandal-that-ravages-nigerias-critical-institutions/. Fidelis Soriwei and Eniola Akinkuotu, “Arms scam: EFCC detains Badeh, gets order to hold Amosu,” The Punch Nigeria (online), Feb. 9, 2016, http://punchng.com/arms-scam-efcc-detains-badeh-gets-order-to-hold-amosu/. Nigeria Economic and Financial Crimes Commission, “Armsgate: how Badeh looted air force funds – witness,” Mar. 17, 2016, http://efccnigeria.org/efcc/news/1801-armsgate-how-badeh-looted-air-force-funds-witness. Kevin Mwanza, “About $15 billion stolen in Nigeria in shady arms procurement deals,” Africa Insider (online), May 3, 2016, http://afkinsider.com/124855/15b-stolen-nigeria-shady-arms-procurement-deals/. Abbas Jimoh, “’Grand theft nationale’: how elites stole Nigeria dry,” Daily Trust (online), July 2, 2016, http://www.dailytrust.com.ng/news/general/grand-theft-nationale-how-elites-stole-nigeria-dry/153491.html. Suleiman Lawal, “Arms deal: when did the rot begin?” Suleiman Lawal, Daily Trust (online), Aug. 6, 2016, https://www.dailytrust.com.ng/news/philosofaith/arms-deal-when-did-the-rot-begin/158030.html. “Nigerian Government Insists On Secret Trial Of Ex-NSA Sambo Dasuki,” Premium Times (online), Jan. 31, 2017, http://saharareporters.com/2017/01/31/nigerian-government-insists-secret-trial-ex-nsa-sambo-dasuki. The value of the naira fell over the course of the Yar’Adua and Jonathan administrations, from 125 to the U.S. dollar in June 2007, reaching a low of 117 in March 2008, before rising steadily to 199 by the time Jonathan left office in May 2015. As the bulk of the transactions occurred towards the latter part of President Jonathan’s time in office, it is likely that the total dollar value of the extra-budgetary spending was towards the lower end of the given range. There is so much in this story that needs to be explored further. The Nigerian Military’s failure to fight Boko Haram and the indication of a coverup of those failures is something that needs further investigation. On the outside, it was as if they were trying to show the public they were doing something but when they failed to rescue the abducted school children, the citizen started to question what was really going on.